Erlanger, KY-Romi Machine Tools Ltd. will display one of its mid-sized Combination Lathes, the M20 x 60 at the Eastec Advanced Productivity Exposition, May 19-21 in West Springfield, MA. 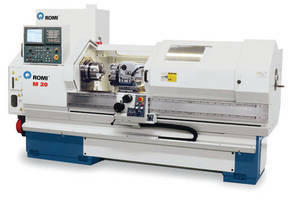 Romi will be exhibiting in their New England distributor's booth (Northeast CNC) in Booth #1460. The M20 features a 15 hp spindle motor and a 20.4" swing over the bed, 10.25" swing over cross slide. Bed lengths of 60" and 80" are available, as are spindles with 2.56" or 3.15" thru holes. Equipped with a GE/Fanuc 21iT control, the M20 can be operated in four different ways: Basic, Manual, Fixed Cycles and G-Code Programming based on type of job. Each mode of operation will be demonstrated at the show. Romi will also display optional tooling and steady rests. Various types of cutting demonstrations will be performed throughout the show. From single piece prototypes to high volume production, the Romi M20 gives users the flexibility to handle a wider variety of work. M20's are in stock and available for quick delivery. Romi is one of the world's largest machine tool builders with an installed base of over 150,000 machines. The company manufactures metalcutting machine tools, plastic injection molding machinery and Romicron® ultra precision boring systems at its 9-plant, 1.5-million sq. ft. industrial complex in Santa Barbara d'Oeste, Brazil. Romi's captive foundry supplies castings for its own line of machine tools as well as for other customers around the world. The company services US customers from its Erlanger, KY facility.